Greetings and blessings to you and yours on Thanksgiving Eve. 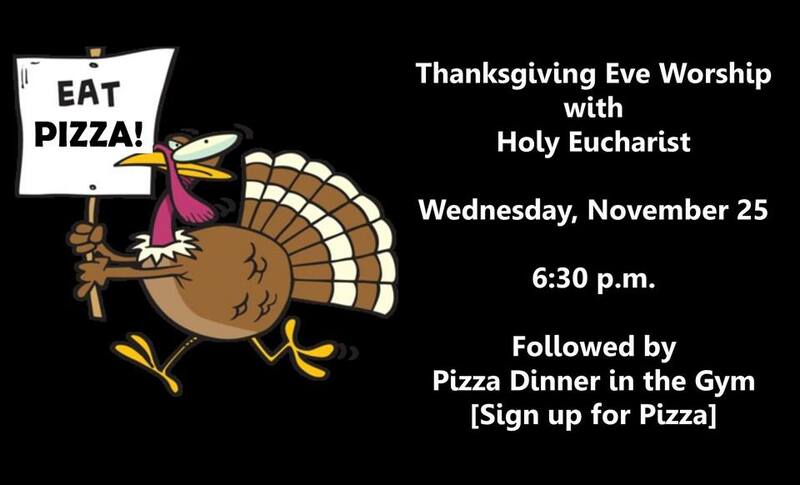 If you’d like to join us tonight for worship at 6:30 p.m. followed by a pizza feast in the Cardinal Gym, but you haven’t signed up yet, just drop a line to Cindy at ca@stjohns-es.org so we can make sure there’s enough pizza for your party. Invite family, friends, and neighbors; all are welcome!This Sunday, Nov. 29, the first Sunday of Advent, the new church year begins. We’ll worship at 8 and 10 a.m. (We will not offer a Saturday service this weekend.) “Be alert at all times,” our LORD tells us, and alert we must be as we manage our busy lives, pay heed to a troubled world, and get ready for the holidays. All that — and then there’s Advent, inviting us to make sure we’ve left enough space for God’s peaceable presence, if we’ve really made an hospitable place in our hearts for the coming of Christ. As we make our way through Advent, St. John’s will gather in the Bishop’s Room each Sunday at 9 a.m. This week, in a class called “Comfort Ye,” we’ll listen to and discuss the dramatic Advent numbers at the beginning of Handel’s “Messiah.” To those in attendance, we’ll pass out free copies of Richard Rohr’s book Preparing For Christmas: Daily Meditations for Advent. The next three Sundays — Dec. 6, 13, and 20 — Mo. Martha and I will facilitate conversations about what you learned from Fr. Richard’s insights, about yourself and about the God we are bidden to receive. Please join us. Finish up your I Advent morning at St. John’s by attending Kathe Hayden’s world-famous wreath-making workshop in the art lab downstairs, right after the second service. Just $10 for materials enables you to take home one beautiful Advent wreath per family. 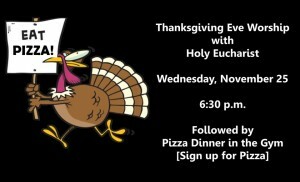 If you haven’t signed up yet, please let Cindy know right away at ca@stjohns-es.org. Finally, please mark your calendars for our Advent Quiet Day — Saturday, Dec. 12 from 2-5 p.m. This Saturday, Nov. 28 at 10:30 a.m., all are invited to a celebration of the life of our John “Chip” Raisin, who died on Nov. 15 after a brief illness. Please keep his beloved wife, Beverley, and their whole family in your prayers as they mourn and celebrate our energetic, always upbeat friend Chip. P.S. 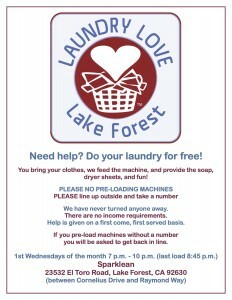 : It’s Laundry Love Lake Forest Time again! 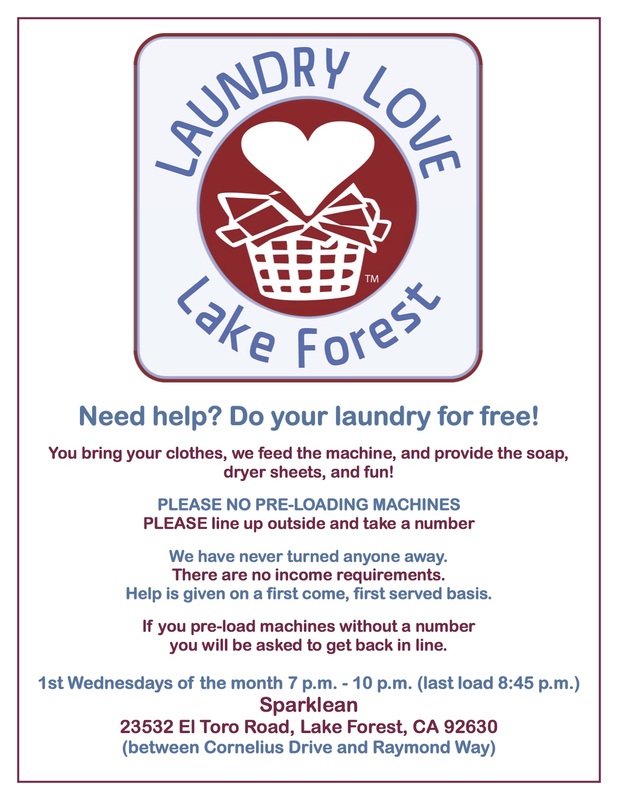 We’ll see you next Wednesday, Dec. 2 — and every first Wednesday — at Sparklean Laundromat, 23532 El Toro Rd., Lake Forest. The suds start swirling at 7 p.m. If you want more details, including the schedule and guidelines for volunteers, then you want to be on Mo. Martha’s growing Laundry Love list. Drop her a line at mjohns@stjohns-es.org. Please help us spread the word about this wonderful service and fellowship ministry. P.P.S. : As always, the new church year will bring lots of news from the Diocese of Los Angeles that you won’t want to miss, including its weekly Episcopal News e-mail. Would you like to receive it? If so, do nothing, and we’ll provide the communications office with your e-mail address. P.P.P.S. : If you want even more Handel this Sunday, Nov. 29, join us at 3 p.m. at St. Cross Episcopal Church for its festive Messiah sing-along. Our Festival Singers friend Gary Toops will be on harpsichord. I’ll serve as narrator, offering information about the composer, his librettist, and their epic oratorio. St. Cross is at 1818 Monterey Blvd., Hermona Beach, 90254.